470 Sluyter Featherspray Adhesive is an economical all purpose spray adhesive (Lace like spray). 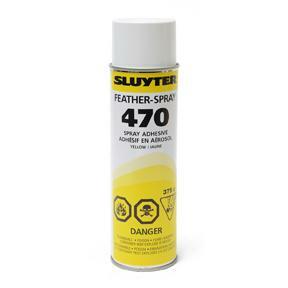 Sluyter Feather Spray 470 provides a strong tack and builds strength quickly. It is excellent for bonding urethane and latex foams to themselves, fabric, paper, burlap, cardboard, foam, felt, cork, rubber and plastics to themselves and to most metals, glass, wood and other surfaces. An efficient and economical solution to your bonding needs. 13.12 ounce can. Lace like spray minimizes excessive soak in and allows for easy placement of adhesive during application. Cautions: Use with sufficient ventilation to keep exposure below recommended limits. Avoid prolonged breathing of vapours. Avoid prolonged or repeated contact with skin. Consult product label. Incompatible with aluminum. Storage: Store in a cool, clean, dry place. Do not heat above 52 c (126 F).